Twisted Audio’s expertise will set you on the right track. 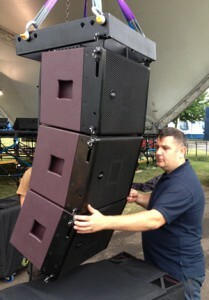 Twisted Audio is the brainchild of Barry Williams, and the pinnacle of a twenty-year career in sound, lighting and AV. Barry has worked in the industry since leaving school, which means that whatever the scope or size of your vision, he has the know-how, contacts and experience to make it a reality. His creative imagination is complemented by an in-depth knowledge of the technical aspects of sound and lighting, and it’s this which gives each of his installations their trademark twist. When you need to buy or hire equipment, use Twisted Audio and benefit from Barry’s wealth of experience in this side of the business. Whether your budget presents a challenge or money is no object, he’ll source what you need and be there to support you at every step from installation to servicing and troubleshooting. Barry specialises in scalability, so if you want a system you can add to at a later date, Twisted Audio’s expertise will set you on the right track. Barry gained his early experience of working in large venues as an employee of First Leisure, then one of the UK’s biggest operators of nightclubs, bars and entertainment facilities. His next venture was a successful freelance career providing sound, lighting and AV services to companies of all sizes and in venues of every kind. Since the birth of Twisted Audio, Barry has been in constant demand for private parties, corporate events and festivals, and has worked with a wide range of high-profile UK nightclubs. Twisted Audio’s convenient base in East Anglia means that wherever your venue is located, they’re well placed to get where you need them to be. This responsiveness and wide geographic coverage is the hallmark of Twisted Audio’s services, and is typical of the edge that puts them in a league of their own.